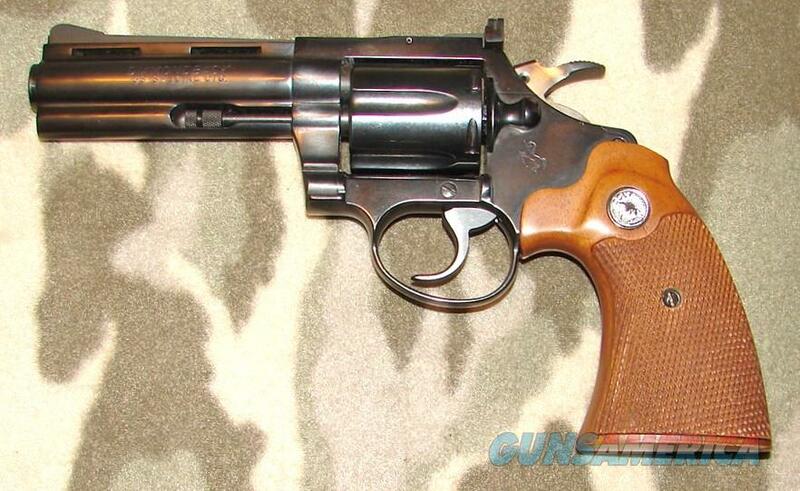 Description: Colt Diamondback #D15717 .38 Spl. 4” bbl. with an excellent bore. This 1968 mfg. revolver retains all of its original blue finish with only two very light blemishes, one on the right side if the ramp half way down the bbl. and the other on the right side of the bbl. near the muzzle. These blems would normally go unmentioned save the pristine condition of the firearm overall. Possibly unfired? The walnut grips with silver colt medallions are also free of blemishes with crisp sharp points . Included is a wood grained box in just about excellent condition. A collector grade Diamondback in the slightly more uncommon 4” configuration.